NEW YORK (AP) — On a muggy summer evening, a woman stood on a midtown Manhattan street corner and switched between raising her hand for a taxi and glancing at her phone, possibly for an Uber car. "She's going to take whoever comes first," yellow cab driver Jatinder Singh speculated as he scouted out the scene. While New York City riders have increasingly more choices in how to get from here to there with the rise of e-hailing apps — and lawmakers grapple with how to regulate the booming industry — the drivers who keep cars moving are stuck in the middle. Uber, a service that allows riders to choose a car type and pay by credit card from a mobile phone, has in four years gone from nearly non-existent to more than 26,000 drivers, joining the city's 13,437 taxis. Some traditional yellow cab drivers say that since the arrival of Uber, the increased competition has cost them about 30 percent of their earnings. Uber drivers also have complained the crowded streets are hurting their bottom line, a notion disputed by the company, which is moving forward with a goal of adding 10,000 drivers by the end of the year. The plan alarmed New York City lawmakers who later backed off a plan to cap the number of cars on the street in exchange for ridership data to study the issue. Here's a look at how the battle for New York City's streets is playing out, through the eyes of those behind the wheel: UBER RISING "In three years, there will be no taxis on New York City streets," Uber driver Michael Keflom predicted as he prowled the streets for passengers in his Mercedes SUV. The 48-year-old driver moved from Eritrea, in Africa, to New York City in the late eighties, and during college started driving a yellow cab — a job he kept on and off for 26 years during a career as a commercial pilot. He says that if Uber had existed back in the mid-90s, he would never have stepped foot in a cockpit. Keflom said he's made it his mission to convince his taxi-driving friends to join him at Uber for the flexibility — drivers own their cars and can work when they want. Liang Wang has been driving for Uber for about a year and this is his first driving job. He chose the company because he believed the yellow cab shift schedule was just too rigid. "The yellow cab schedule, you have to wake up at midnight or finish really late. And I have a daughter," said Wang, who drives five to six days a week around his family schedule. SUFFER THE TAXI DRIVER Noureddine Benbedda, who owns his own yellow cab, said he used to take home $700 a week after paying a garage and the lease on the city medallion that allows him to drive. Now he's lucky if he brings home $500. He used to have another driver take the night shift who has since quit, leaving Benbedda to drive longer hours to make up for it. "My family is suffering now," he said. Mohammad Sultan echoes Benbedda. After 27 years as a taxi driver, the 59-year-old says his earnings have dropped by $200 a week. Even though he's lost 30 percent of his business since Uber arrived on the streets, he remains positive. "It's good that there's no more taxi monopoly," Sultan said. "Now we have another opportunity." IN BOTH DRIVER SEATS Driver Jatinder Singh has seen both sides: he drove with Uber and returned to driving a taxi. "The drivers who are suffering they want to come back to a cab, but they can't, because they bought a brand-new car," he said. "My friend bought a Hyundai Sonata hybrid and they're stuck for good, for five years until the car is paid off." He owned a yellow cab, which he decided to paint black so he could start driving with Uber. That lasted about six months before he sold the car and returned to taxi driving. Singh hoped the surge pricing at Uber — it costs more to get a lift when demand outpaces supply— would make up for the lack of tips, but the money never came. "They had so many drivers, too many drivers." 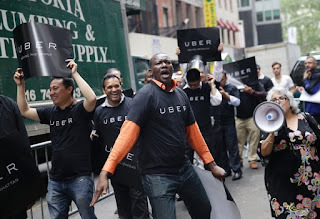 Bhairavi Desai, executive director of the New York Taxi Workers Alliance says the problem lies in Uber's model, which she claims was never created to serve full-time drivers. "For them it's a gig economy. If you're a full-timer, you can't compete with the flood of vehicles," she said. "I don't want to mince words here, for generations it has been a full-time job."